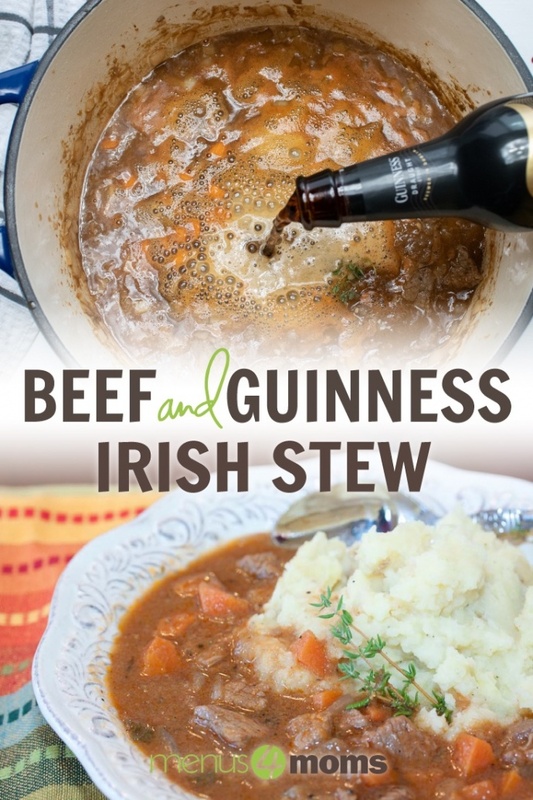 Irish beef stew made with Guinness® stout beer is perfect for St. Patrick’s Day. I have found it to be a foolproof recipe and is similar in preparation to other beef stews. 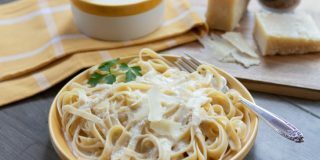 If you want to have it on a day when you will be out and about in the afternoon, it can be started on the stove top and simmered in the slow cooker. 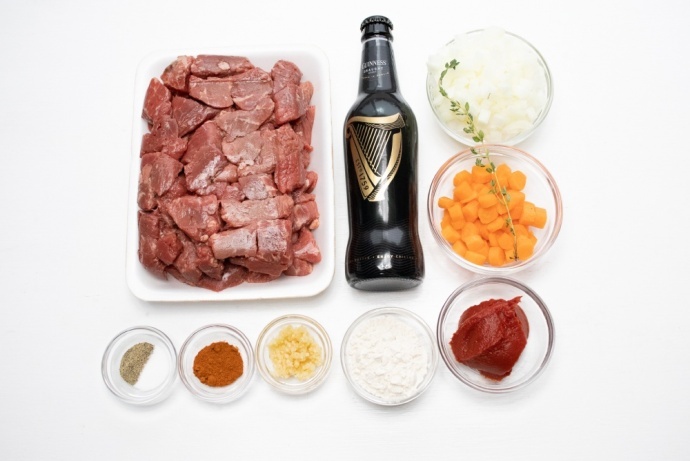 Start with beef stew meat, Guinness® beer, onions, garlic, carrots, tomato paste, flour, cayenne, salt, and pepper. Put a tablespoon of oil on the meat and add the flour, cayenne, salt, and pepper and coat the meat well. Brown the floured meat in oil, then add the chopped onion and garlic. Sauté until the onions are tender, then add a bottle of Guinness® and scrape the pan while stirring. 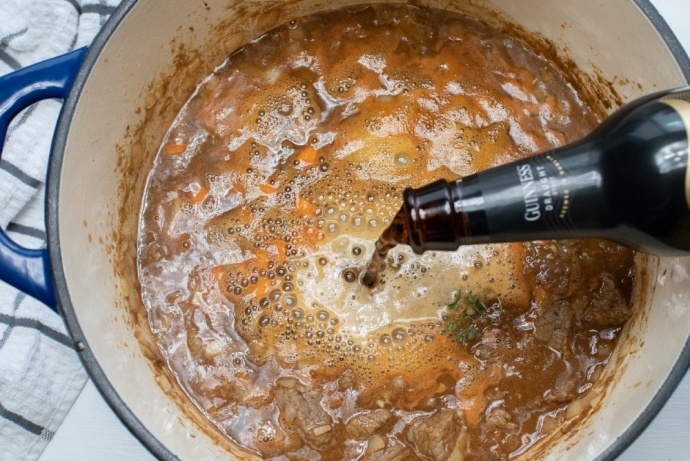 Add the tomato paste and stir well to mix it in with the beer—you should have a nice base to the stew, and you can add the carrots, thyme, and the remaining half bottle of Guinness. Stir gently until the liquid is an even consistency, and leave to simmer for 2 to 3 hours. That’s it! Serve over mashed potatoes (I like to add a side of Irish soda bread). Full recipe follows video and Q&A. Can I make Beef and Guinness® Stew in the slow cooker? Absolutely! You’ll need to start the recipe on the stovetop to brown the beef, but when you get to the point where the stew needs to simmer, you can transfer it to a slow cooker and cook it on low for 3-4 hours. Be mindful of how hot your slow cooker cooks since they all heat differently. Larger volume slow cookers will cook the same amount of food much faster than a smaller volume slow cooker. Can I make Beef and Guinness® Stew in the Instant Pot? Yes, but you’ll have to adjust the order of cooking. You should never add flour or other thickeners before the pressure cooking cycle since it can cause food to stick to the bottom of the pot and burn (and the pressure cooker needs the thinner liquid to create the steam that forces the pot to go under pressure). I have not made this recipe in the Instant Pot, but I adapted a Mexican beef stew for the Instant Pot and it follows a similar preparation method. For Beef and Guinness® Stew in the Instant Pot, I would recommend browning the meat in the oil without the flour (you can put the cayenne, salt, and pepper on it), then add the beer, onions, garlic, thyme, and carrots to the pot. Cook on manual pressure (high if you have the option) for 25 minutes. NPR for 15 minutes, then release pressure and open lid. Mix the flour with about 1/2 cup of the liquid from the pot, whisking well to get any lumps out. Add the flour mixture back to the pot and stir gently to mix. Add the tomato paste and the remaining beer and heat on sauté mode for just long enough to heat through (watch carefully for burning – this won’t take long). 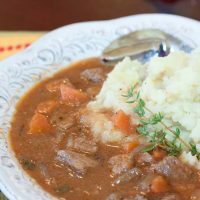 Turn off the Instant Pot as soon as the stew is hot and serve the stew over mashed potatoes with Irish soda bread on the side. Do I have to use Guinness® beer? No—any stout beer will work, but I have always used Guinness®. Some people even use red wine instead of beer, so you can experiment with various types to see what you like best. I would not use a lighter colored beer or white wine as it will not have the depth of flavor needed. Is this an authentic Irish stew recipe? An authentic Irish stew would have been made with lamb and potatoes because of the local availability of the products prior to the potato famine in the 19th century. 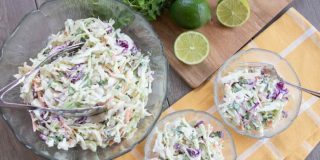 As the Irish migrated to the United States during the famine years, they introduced their traditional recipes, which have have evolved over time. Rather than mashing the potatoes and serving them with the stew, the potatoes traditionally would have been added to the stew whole or chopped. 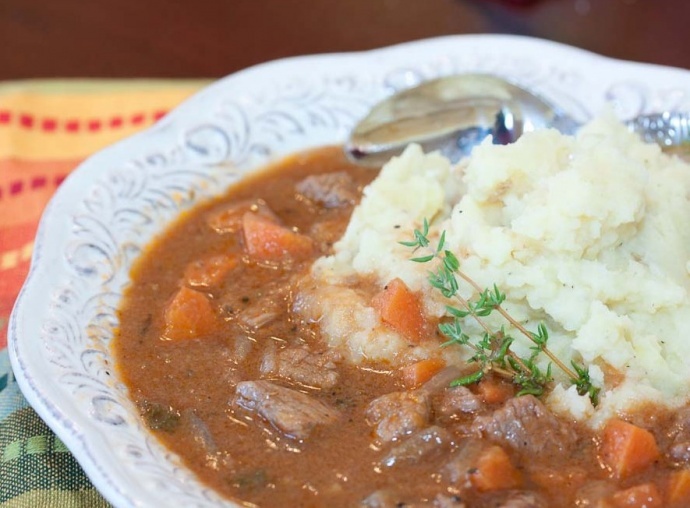 Mashing the potatoes is just one of the ways Irish stew has evolved over time—because of its availability, we typically use less expensive beef in place of lamb, and more recently recipes include tomato products and alcohol for depth of flavor. This delicious Irish beef stew made with Guinness® stout beer is perfect for St. Patrick’s Day. 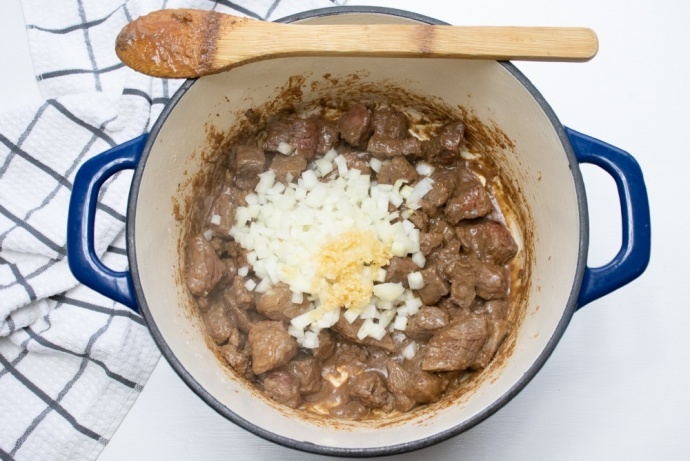 Place beef cubes into a large bowl and drizzle with 1 Tbsp. olive oil. Mix well. In a separate dish, combine flour, salt, black pepper, and cayenne pepper; mix well. Sprinkle flour mixture over beef mixture and toss to coat. Heat remaining oil in a large fry pan or Dutch oven. Add beef and cook on medium-high heat, stirring frequently, until browned. Add chopped onions and minced garlic and cook until onions are tender-crisp. Add 1 bottle of stout beer to pan and stir, scraping any food from the bottom and sides of the pan. Add tomato paste and stir until well blended. Add carrots, thyme, and remaining stout beer. Cover and cook at a simmer for 2-3 hours, stirring occasionally. Serve over mashed potatoes. 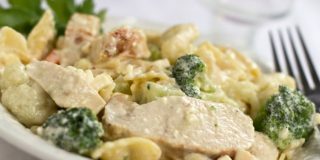 This is dinner tonight… followed the recipe exactly, and it is delicious! The perfect comfort food for a chilly spring day—family approved. Just made this and mashed potatoes and it was so good We usually have Guinness around cause Chris likes it. But today the only place that sold alcohol was too expensive. So we used Michelob Amberbock and it still turned out great I did mine in the crockpot though instead of stove. So glad you liked it! It is one of our family’s favorites.